With the supply of natural stones diminishing worldwide, what repercussions can the industry expect? RAPAPORT... While it’s true that value comes from rarity, no natural resource lasts forever, and the rare is becoming even rarer. Diamond production is set to peak in 2019, after which it will begin a steady decline. De Beers estimates global output will fall by 1% to 2% a year until 2030, while some analysts predict as much as a 5% annual drop. Regions that have heavily dominated the trade over the last five decades are now reaching the end of the line, and new exploration projects may not be able to compensate fully for their loss. 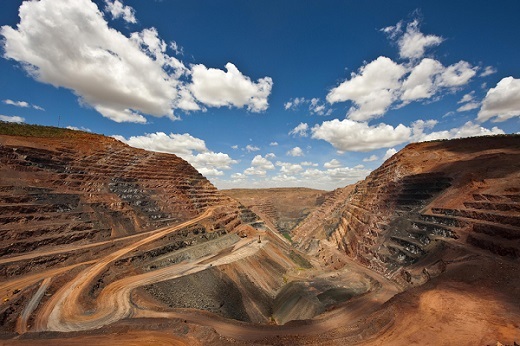 Rio Tinto’s Australian asset, Argyle (pictured), is expected to close in 2020, while its Diavik deposit in Canada’s Northwest Territories (NWT) has a mine life through 2034. These resources are a drop in the bucket in terms of their contribution to Rio Tinto’s finances, but the same can’t be said for their impact on the industry. Argyle’s 14 million-carat yearly production makes up around 10% of the world’s total annual diamond output, and the mine is a dominant player in the colored-diamond market. Other NWT assets, including Dominion’s Ekati mine and the joint Mountain Province-De Beers venture Gahcho Kué, are also expected to run out around 2034. And while extensions have been discussed, they have yet to come to fruition. A case in point is the Jay pipe expansion of Ekati, which has been suspended several times while Dominion conducts viability testing. As these old and loyal fields dry up, newer pastures are taking their place. But newer doesn’t always mean greener. Angola, a diamond-rich country, has long been a questionable prospect due to stringent rules that make it difficult for potential miners to invest in projects. The Central African Republic (CAR) only recently came into line with the Kimberley Process, and in any case, its diamond reserves are not as great as other countries’. Hodgson also thinks the African nation of Lesotho could help counterbalance the deficit in other countries, as well as relatively unexplored regions of Russia. However, the shift won’t happen immediately, nor will it be a simple endeavor. While almost all economically viable deposits can be mined, says Hodgson, the investment required to establish them can often exceed the return. Beyond the impact on miners, what does the potential shortage mean for the industry as a whole — for diamond manufacturers and jewelers? What about for the average consumer? Will sourcing become more difficult, and will prices inevitably rise? Experts seem to have mixed feelings. Amelkin says the drop in production will lead to a shortage, one that will mean an increase in prices for rough, while Boris Sinitsyn — a metals and mining analyst with VTB Capital — says its biggest effect will be on the end consumer, as the scarcity will surely push the price of diamond jewelry up. Lieberherr thinks any price changes will be gradual as the diamond supply decreases, and therefore won’t be as noticeable down the line. That said, he believes price inflation is good — not only for the industry, but for the diamond-buying public. One particularly timely question is the effect a diamond shortage will have on the synthetics industry. Will lab-grown stones gain a stronger foothold in the wake of depleting natural supply and rising prices? In that regard, most of the experts agree the natural-diamond trade has nothing to fear from its lab-created competitors. At best, they predict synthetics may take over the lower end of supply. “I do think…that synthetic production would displace material volumes at the lower end of the value chain, just simply on an economic basis,” says Hodgson. Lieberherr feels synthetics have a place in the fashion jewelry market, as does Michael Minister, owner of Canada’s Maple Leaf Diamonds — but “not for engagement or bridal,” Minster says. Sinitsyn and Meeus also see lab-grown as a lower-end substitution or “niche” product, but not as an actual competitor, regardless of the supply. So what will actually happen as some of the world’s biggest mines turn their lights out and shut their doors? This article was first published in the August 2018 issue of Rapaport Magazine.